You probably believe that the most crucial aspect regarding flossing is simply to do it every day. We agree. However, many people find that trying out a few different types of floss helps them to establish or solidify the habit and get the flossing comfort they desire. Let’s examine some of the most common types of dental floss. Basic floss is either a monofilament floss, which is typically made of some kind of rubber or plastic, or multifilament, which is made of nylon or silk. Nylon floss is less expensive, more common and is sold waxed or unwaxed. Monofilament floss will not rip or tear, and because of this, many people find that it pulls in between the teeth easier. This type of floss is frequently referred to as “glide” floss. Both monofilament floss and multifilament floss are sold in differing thicknesses. It is useful to find the size that works best for you. 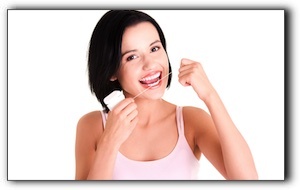 Since you should not have to snap the floss between your teeth, find the thickness that allows you to gently floss. Dental tape is nylon floss in the form of a wide, flat ribbon. Many patients find that dental tape is the easiest floss to get between their teeth. For those of you with braces or appliances, there are also flosses designed to be used with these devices. Make sure to communicate with your orthodontist about flossing because you don’t want to break this vital habit just because you’re having your teeth aligned! A good person to give you guidance about flossing is your dental hygienist. Our proficient hygienists are prepared to answer any questions you have about flossing, brushing habits, and even cosmetic dentistry procedures such as teeth brightening and veneers. My name is Dr. Jared Theuer. My practice, The Sugar House Dentist – The Sugar House Dentist, has been serving the Salt Lake City area since 2006. Our top services include: family dentistry, dental veneers, and full mouth rehab. Call us today at 385-299-7840 for your appointment! You can also visit us on the web at https://www.thesugarhousedentist.com/blog/.